* Caravelle Epicee starts with a mix of woods and dry spices – cedar, cumin, coriander, and cognac. * Maybe it’s because Frapin is known for producing cognac, but I definitely smell a hint of sweet cognac throughout the scent’s development. * It heats up on the skin as pepper intensifies the spices and woods in the mix. * Each wear is a a bit different – the spices vary in their position with coriander, cardamom, nutmeg, and cumin jockeying for the lead role. * The spices lighten up and the base comes through with a sweet mix of amber, tobacco, sandalwood, patchouli, and a touch of booze. Summary: Although I love the name – Caravelle Epicee – two better names would be Spicebomb and Spice and Woods – but unfortunately those were taken by other companies (Viktor & Rolf and Creed). The scent is robust, hearty, and very warming in both comfort and heat. Although I am not a bottle collector, the bottle has an amazing feel to it with a very strong, substantial feel. Longevity is great, the scent lasts more than twelve hours on my skin. Projection is strong for the first hour, then it calms down- which makes it office-friendly if you spray it on an hour before you go to work. Something about the scent also smells really expensive and refined, like a luxury item that is well-worn yet maintains its high quality. 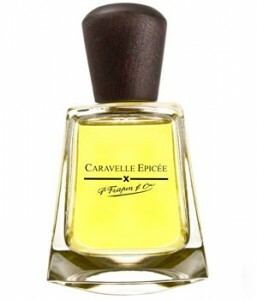 Frapin Caravelle Epicee is available from LuckyScent. Image courtesy of LuckyScent. No disclaimer needed as I own a bottle.